European Coaching Corner: 7- What are the steps to take in teaching soccer? 7- What are the steps to take in teaching soccer? If we pretender that the young players could in the future be successful in college, University or professional, are fundamental that their training begins at the base, because so with a good base you can reach the top. From the moment them start practice soccer, until reaching a level high yield the young players should (or should be) go through a process of consistent develop there is a progression of learning that is distributed over different stages, with objectives, strategy and content, adequate to their different stages of development. If we want to structure the soccer and to raise the quality level of our soccer players, we cannot continue to work at random assisting at the implementation of the same contents and the same methods of training whetherU8, U15, or pros, with the beginning of competitive games made right from the 8, 10 years of age, where the most important are win the championship. In the process of forming a young player, "Winning are not the most important, are important to learn to play soccer, for later get the victory". The soccer is a game that has a structure and a set of situations too complex for young players, in its early stages of learning the game. 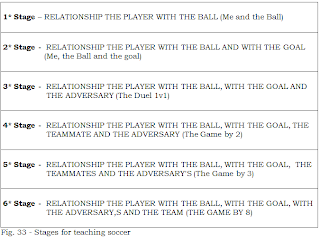 These are because, the player has to, at one time, relating with the ball and refer their situation in the field of play, the position of teammates and adversaries and the goalie. Are fundamental create in soccer situations simple to meet the motivations of young players, providing them with simple shapes, upgraded its features and their level of development for facilitate better learning of soccer. 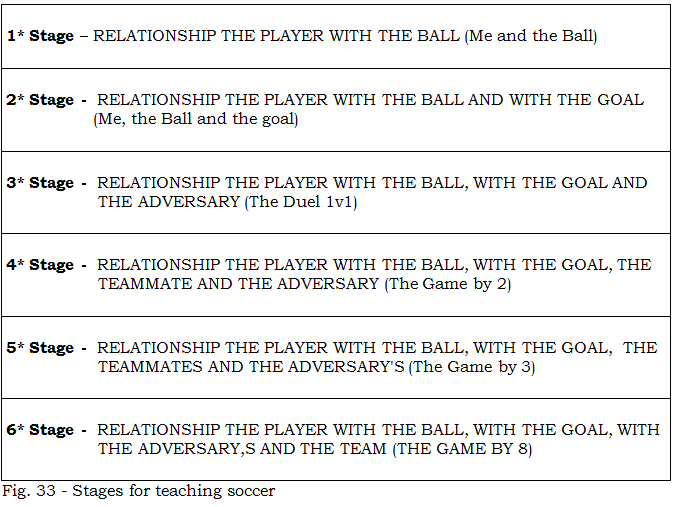 We can associate the teaching of soccer to a One process of CONSTRUCTION. So, as in the construction of a house we started the foundation, passing through floors, walls, roof …, in "Construction" of a soccer player, he will incorporate (phased) the different elements of the game. Ball, Goal, Opponent(s), Teammates and team, so that at the end of the process of develop have an effective and efficient abort of the game (formal).